alaTest has collected and analyzed 96 reviews of Samsung VP MX20. The average rating for this product is 4.0/5, compared to an average rating of 4.0/5 for other Camcorders for all reviews. Comments about the size and battery are overall positive. The portability and usability are also mentioned favorably, but many are negative about the viewfinder and design. We analyzed user and expert ratings, product age and more factors. 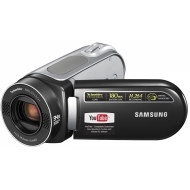 Compared to other Camcorders the Samsung VP MX20 is awarded an overall alaScore™ of 83/100 = Very good quality. alaTest has collected and analyzed 34 user reviews of Samsung VP MX20 from Amazon.co.uk. The average user rating for this product is 4.3/5, compared to an average user rating of 4.0/5 for other Camcorders on Amazon.co.uk. People really like the image quality and memory. The portability and price also get good views, but some have doubts about the design. Affordable standard-def camcorder optimised for YouTube uploads and video blogging. Despite its prominent YouTube branding, the VP-MX20 is not really a Net-cam; at least, not in the traditional sense. Nevertheless, it should prove adequate for casual users who require a cheap point-and-shoot camera. The VP-MX20 doesn't have the spec for the video-making enthusiast, but it is cheap and YouTube-friendly. The VP-MX20 is the cheapest camcorder here, but it feels like a serious camera rather than a novelty gadget. The bulbous design looks smart and durable, and the swivelling handgrip makes it easier to shoot from waist height.